This site is currently under construction. Thank you for your understanding. Please report any problems using the 'Contact' Tab. Bringing the parlor magic of the Victorian Era into the modern century, The Great Cigma combines family entertainment, engineering, and magic to create a show that is a remarkable, one-of-a-kind magical experience. Not convinced? Check out the promo video below for testimonials, crowd reactions, and a taste of the magic. Use Promo Code BDAY and save! I highly recommend The Great Cigma! I work for CIP, Community Inclusion Program, which is part of the non-profit group PAVE (Partnerships for Action/Voices for Empowerment). At CIP, we provide events, information and support for families of children of all abilities. For our end-of-the-year event of 2015, we were fortunate to have The Great Cigma provide entertainment! 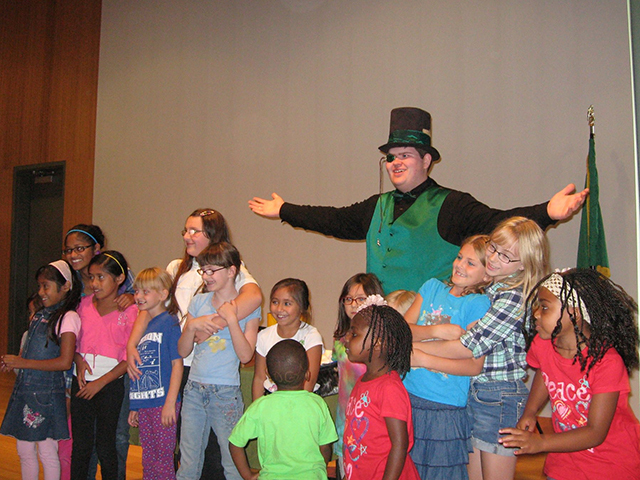 The Great Cigma volunteered his time and talent as a magician to give our families a wonderful show. I was a little skeptical about having a magician come to our event. I wondered if his "tricks" would be scary, thinking back to other magic shows I've seen where people are "sawed" in half or made to disappear. Cigma's show was nothing like that! It was filled with humor, wonder, and audience interaction. From the start, Cigma did some funny tricks to get everyone comfortable. The kids were captivated! Throughout the program, Cigma managed to invite each child who expressed an interest to come up and be a part of the show. Many of the children who attend CIP have various ability levels, such as autism, Down's syndrome, ADHD, and other challenges. Cigma treated each child with respect and gentleness. Many kids got to be the "star" that night! He handled the audience very smoothly, dealing with shout-outs with grace and humor. Best of all, as I looked around the room, I saw that all the kids were truly engaged and on the edge of their seats...and parents were smiling, laughing and enjoying themselves too. It's not often you attend a show geared for kids that parents can also really enjoy. I appreciated that the magic tricks weren't creepy or spooky and that humor was a big part of the show. From the introduction until the grand finale of a surprise shower of confetti, Cigma's magic show was full of delights! Looking for a family or children's show for a large venue such as a children's museum? Planning something special for a summer camp, daycare, or school carnival? The Great Cigma has you covered! The Great Cigma has performed at venues such as Star Lake Elementary Eagle Academy, Twin Lakes Elementary school carnivals, Seattle Children's Hospital, Tacoma Kindercare, and The Moses Lake Museum and art Center (see photo below).